At the 2019 NAB show this week in Las Vegas, Electro-Voice is marking the 50th anniversary of the RE20 microphone featuring Variable-D technology. Visitors to the show can get a free RE20 50th anniversary T-shirt at booth C5509. Also starting with day one of NAB is a special pricing promo — $50 off an RE20 at participating U.S. and Canada dealers until August 31, 2019. The company also plans more RE20-related events in the coming months, which will be announced on EV’s Facebook page as well as via local EV dealers. The RE20 dynamic microphone continues to be among EV’s most recognizable products, utilized in a wide range of sound reinforcement, recording and broadcasting applications around the world. Variable-D and a heavy-duty internal pop filter help optimize close-in voice work, while an internal element shock-mount reduces vibration-induced noise. 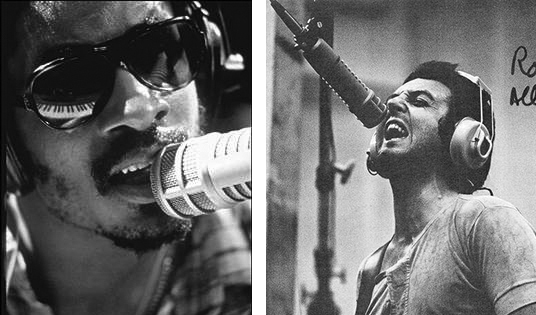 After the RE20 was introduced, its popularity soon extended beyond broadcast into music production as an instrument and vocal mic, utilized on recordings from artists such as Paul McCartney, Stevie Wonder (both pictured directly below), Bob Dylan, and Radiohead, among many. Led Zeppelin’s John Bonham was an early adopter of the RE20 on drums, followed by other percussionists. More recently, the RE20 has found an enthusiastic new fan base in the podcasting community, where it combines ease of use with professional results on vocals and voiceovers. Find out more about the RE20 here.